Grizzly T27792 - Polishing Kit, 3 pc. This kit lets you take a project from start to finish in three easy buffs! 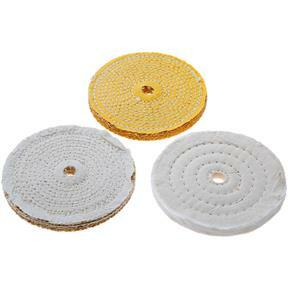 Includes 1 standard buffing wheel, 1 rouge buffing wheel, and 1 sisal buffing wheel, all 6" in diameter with a 16mm center. Buffing compound not included.